How difficult is putting in contact lenses? Find out here. 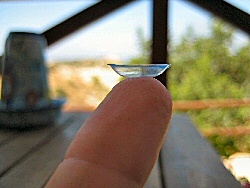 Are you a first-time contact lens wearer? Maybe you are thinking about trying lenses but are scared of putting in contact lenses let alone how to remove contact lenses! It IS a bit scary at first as most people hate the thought of touching their eyeball but a little practice makes perfect and once you get the hang of it, putting contacts in is really easy. WRONG - this lens is inside out. Most people wear soft contacts so I'll start with putting in soft contact lenses the correct way. Soft lenses are by nature, well, SOFT! That means they can bend easily and consequently they can turn inside out. This can happen when taking a new lens out of its pack for the first time or the lens may have turned inside out during storage. You should obviously put a lens into its storage box the RIGHT way up...but after a drink or two or when you're really tired, this doesn't always happen! How can you tell if it's the right way round? It does take a bit of practice but look at the pictures above and you will see that in the CORRECT picture, the edge of the lens is pointing up and slightly inwards - in a CONCAVE shape. The edge of the lens in the WRONG picture is pointing outwards - in a CONVEX shape. There's another little trick too. Most brands print a tiny 1-2-3 number on the outer edge of the lenses. Hold the lens up to the light and, looking down on the lens, if you can read the numbers correctly then the lens is the right way up. To put a lens in, first clean and dry your hands thoroughly, then open the pack or storage case and with your fore-finger or any other finger that suits, scoop up the lens from the solution. Transfer the lens onto the finger used for putting in contact lenses and check it's the right way up. Make sure the majority of the lens is in the air rather than adhering to the finger; if this happens, you won't be able to get the lens into the eye as it will just stick to your finger. Lift your finger close to the eye and gently place the lens into the eye keeping your eye open as wide as possible. Some people lift the eye-lid when putting in contact lenses, but I find this is an extra task that makes inserting soft contact lenses more difficult. But do whatever works best for you. Once the lens is sitting on the eye, blink a few times to let the contact lens settle over the iris. If the lens feels uncomfortable, there may be a tiny hair or particle of dust on the lens. 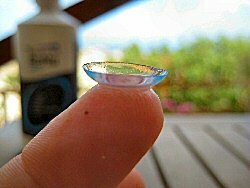 If so, remove it, pop it back into the contact lens solution or pour some lens solution onto the lens with the lens held in the palm of your hand. Then try again. Removing your soft contact lenses is covered on a separate page here. Just follow the same steps for putting in contact lenses (soft) above but remember that if you are a first time RGP lens wearer, then putting in RGP contact lenses may feel very uncomfortable at first. It's a bit like having something in your eye but you just can't see what it is. Removing gas permeable contact lenses is different too and is covered on a separate page here.